Riding holidays Italy. Near Amalfi, live the Italian lifestyle, eating beautiful food and wines and horse riding through rolling hills to ancient villages and the beach. Stay at a family owned farm and immerse yourself in the Italian lifestyle, eating beautiful food made right on the farm, drinking nice wines and horseback riding through rolling hills with olive trees and vineyards, quaint, old villages, award-winning beach and to high points overlooking the stunning Mediterranean Coast. The farm is located in the southern part of the bay of Salerno, just south of the popular and posh Amalfi Coast. Situated outside of the small Italian town of Casal Velino and within Cilento National Park, Mediterranean forest is juxtaposed with the bright blue sea. Since the farm is only about 3 miles (5 kilometers) from the coast, you’ll have views of the a sea on many rides. Learn about the area's unique history riding by ancient ruins, and small towns and villages. Canter on the beach and relax by the pool at the farm. The agriturismo, a farm that welcomes guests to enjoy rural life, was started over 12 years ago. This farm produces sumptuous foods and wines. They also produce their own extra virgin olive oil, cheese and all kinds of vegetables, meats and more-- all fresh ingredients that you will taste in wonderful Italian meals. This is a family run operation, where you will be made to feel at home. There are various well appointed accommodations on the property and a swimming pool. There is a spacious and comfortable restaurant where you can try the best local food and regional wines from a well stocked wine cellar, a shop and also a small cheese factory. There is plenty to do here for families and non-riding companions, including a special cooking class vacation. Please see Equitrekking Travel’s General Packing List. This part of Italy is where the mountains meet the sea, granting a mild climate. The owner of this Italian farm is a horse lover, whose passion for horses inspired him to begin the trekking program in this part of Italy. There are versatile horses, mainly of local Italian origin with some Anglo Arabs. 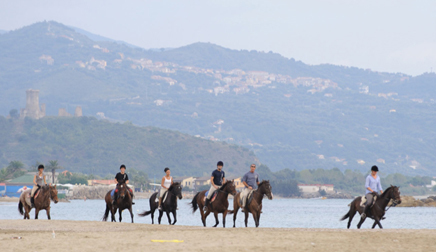 The horses are sure-footed and steady, well used to the rugged terrain and beaches surrounding this Italian getaway. They spend most of their time outside and only go to their stalls when they are ready to be ridden or are being fed. The riding style and tack is English. There are plenty of activities for riders and non-riding friends. The farm is located in the center of Cilento National Park, in Casal Velino, surrounded by the ocean, rolling hills and Mediterranean forests. Close to the Amalfi coast, there are ample nearby destinations for day trips including Sorrento, Vietri, Positano, and Capri (by boat for a day tour), Ravello, Palinuro, and Camerota, Acciaroli, Castellabate, Velia, Paestum, Pompeii, Ercolano, and Naples. Take a guided tour of the nearby historical site of Velia, Paestum or Pompeii. Swim in the pool or hang out in the solarium at the farm, hike, take a cooking class, relax and eat amazing food, go to the beach, help out on the farm by picking olives, milking the goats, or making cheese in the farm’s cheese-factory. The area has received a“ Blue Flag” and the 5 sails of Legambiente for the high quality of its crystal clear water. Shop in the nearby towns or in the farm’s small shop, where you may purchase goat-cheese made in their own little cheese factory. This route is one of the best known in the area and follows the southern slope of Mount Stella. It starts in the panoramic town of Casal Velino following an easy path which offers you a splendid view on the country and takes you to the town of Celso. This route follows the crest of Mount Stella and is one of the principal mountain paths of the area. I Moresani is a hilltop farm with views over the park. Accommodation is in beautifully restored cottages, simply decorated and furnished in keeping with the local style. A swimming pool is open in warmer months. You’ll eat well on this Italian equestrian vacation. The family started their farm over twelve years ago. They have a cheese factory, produce their own extra virgin olive oil, wine and all kinds of vegetables, meats and more. If you are out for a full day of riding, lunch is served out on the trail, perhaps amid olive or oak trees with local wine. There is a spacious restaurant at the farm, where you can try the best local food and regional wines, a little store room and shop with the farm’s products, including a special kind of goat cheese. The wine cellar offers not the farm’s own excellent wine but also some of the best labels of the region Campania. Everything is prepared by the farm's owners, a wonderful Italian family, including sweet and salty sausages, salami, goat cheeses, extra virgin olive oil, wine, liquors and honey. The food prepared is based around the seasons. The farm is part of the Slow Food movement, an international movement founded by Carlo Petrini in Italy in 1986. Now with a global following, slow foodies seek to preserve traditional and regional cuisine by promoting the farming of plants, seeds and livestock that's local to the environment. Single travelers, families and groups of English riders with their non-riding companions who want to experience Italy equestrian vacations on good Italian horses, delicious Italian food, cooking classes, and sightseeing along the Southern Italian Coast. People who enjoy a relaxed, family atmosphere and want to spend time on a working Italian farm/ ranch, "Agriturismo" near the beach and Cilento National Park, part of the MAB-UNESCO reserve. The package includes a trek of inland Cilento leaving from the agritourism, staying at different hotels and B&B's along the way and returning to the agritourism. It is designed for experienced riders who wish to explore Italy on horseback, stopping off at different points within the Cilento National Park. * Prices shown are subject to exchange rate fluctuations. This riding vacation runs with a minimum of four people. Trip Italy riding vacation takes you horseback riding through diverse and striking scenery, including river valleys and mountainous and terrain with forests of oak and chestnut trees. The horses are all trained in English riding and particularly suited to trekking. You will normally ride for 5 or 6 hours a day, with a longer stint in the morning and shorter in the afternoon. The agritourisms where you will stay these are chosen based on authenticity, quality of food, comfort and adequate accommodation for the horses. They are basic but of good quality. Dinner and breakfast are served in the agritourism with particular attention paid to the use of typical products. Overnight accommodations are in in double or triple rooms. The choice of a single room only applies to the nights spent at the main farmhouse. Welcome dinner to get to know the guides, presentation of the riding vacation week and overnight stay. Enjoy Breakfast followed by a full day’s ride with picnic. Return to the agritourism in the afternoon; dinner and overnight stay. After breakfast, we leave the hills of the agritourism and head towards the sea along the valley of the River Alento. After lunch, we return to the agritourism by mini bus; the horses remain at Moio della Civitella. Dinner and overnight stay. Breakfast at the agritourism then departure by mini-bus to rejoin the horses. We ride on through an area of rich vegetation and characteristic mountain villages up to Rofrano, where, in an old renovated convent, we will take our overnight stay and breakfast. We set off for the village of Cuccaro Vetere, along the foothills of Mount Gelbison. The view here is amazing and overlooks the enchanting bay of Palinuro and the Tyrrhenian Sea, as well as Mount Bulgheria (1225m asl). In the village of Cuccaro Vetere we stop for the night at a local B&B. After breakfast we head towards the sea through dense forests of chestnut trees and ferns, until we reach Mandia; then riding along the old salt road we reach the sea and Velia Elea, cradle of the ancient philosophical school of Parmenides. Return to the agritourism for dinner and overnight stay. ** The above is a sample itinerary. It is subject to changes based on the weather and the trip guide’s discretion. This Italy riding vacation is designed for experienced riders who come to Italy to discover a little bit of heaven: the Cliento National Park in Campania. It includes 5 days trail riding with organized picnics and half-board accommodation at the agritourism. You'll need to be able to walk, trot and canter for this riding tour. * Prices shown are subject to exchange rate fluctuations. This riding vacation runs with a minimum of two people and a maximum of four people. Includes: 5 days trail riding with organized picnic and half-board accommodation at the agritourism. Not Included: Flights, transfers; tips; drinks; non-riding excursions; lunches on non-riding day if you are away from the agritourismo. Transfers: Airport transfers from Naples start at $92 per vehicle each way at set times (payable locally dependent on group size) . It is also possible to make your own by train from Naples or by rental car. On some days you will ride high up into the mountains with extraordinary views of the surrounding countryside, on others you head to the shore for faster rides along the sandy beaches. Farm trails lead you through fruit orchards on the valley floor, into terraced olive groves and to beautiful wilderness areas of wild broom, rosemary and fennel. Other routes pass through ancient villages clinging to the steep valley sides where you may stop for a coffee in a local bar. Well aware of the beauty of our countryside and of its historical and cultural significance, we believe that discovering these places on horseback is one of the best way to fully appreciate them. The week includes 5 days trail riding and a rest day so that guests can relax or do sight-seeing. Picnics are prepared in-house so they are varied and tasty: in the shade of an olive tree or kissed by the sun, but above all every day in a new fantastic place! There are a number of exciting routes which you may do, which could include the following trails. After preparing the horses we’ll head towards the sea, where we can canter along the sandy beach as far as the foothills of Velia Elea, cradle of the Eleatic School founded by the famous philosophers Parmenides and Zeno. Continuing on our way, we’ll ride through ancient olive groves and breathe an air rich in history and mythology: we’re on the crest of the gods, close to the terraces sacred to Jupiter! Here the trail skirts the walls of the ancient city, immersing us in an exceptional landscape pungent with herbs typical to the Mediterranean maquis. After this exhilarating morning, we stop for lunch: some excellent home-produced grilled meat, a glass of good wine, warm air, clear sky, lush countryside and great company! There’s no better way to unwind for a couple of hours before resuming our journey. Back in the saddle, we ride down to the plains and reach the stables of the agritourism in the afternoon to the rhythm of trot and canter. We set off along the road that skirts the hill to the right of the agritourism, and ride for approximately 3 km until we reach the little chapel of St. John, dating 1300, probably built by Basilian monks. We continue to Celso along trails that immerse you in nature so that you can fully appreciate the beauty of the Mediterranean maquis, with its brooms, bramble, heather, holly oak and rowan. We enter Celso through the arch of Palazzo Mazziotti. Celso, an ancient medieval village dating 1050, was the scene of the events of the Risorgimento in Cilento (1828 and 1848). After leaving the village (418m above sea level) we continue to Pollica through the green Mediterranean scrubland, passing a young chestnut forest on our way. Meanwhile, a breathtaking view of the sea opens up in front of us! We enter the town by skirting around the Franciscan convent founded in 1611 by Prince Capano. Pollica is a very characteristic town: of particular note are its many beautiful stone doorways and especially the 17th century tower of the palace of the Capano princes which overlooks the village. Here we stop for a tasty picnic, prepared in-house, accompanied by a refreshing glass of wine. Leaving Pollica, we ride along narrow paths, valleys and streams to Pioppi, and so the sea. We will return to the agritourism during the afternoon, buzzing with the emotions of the day. We ride through a colourful landscape dotted with olive-trees to reach, after 2km, a stream which will lead us to a ford over the river Alento. From here, we ride towards the hills past vineyards and olive-groves, leaving behind us a beautiful view of the Gulf of Casal Velino and Velia Castle. We ride towards Castel Nuovo Cilento where we will stop to rest, eat and visit the medieval castle. This site of clear medieval origin was a very important bulwark at the time of the saracen invasions. Later it became the administrative centre of the feud of Guido d’Alemagna. On the way back, after a downhill ride through olive-trees, we arrive at Pantana where we find the Franciscan monastery of Saint Clare. In front of us stretches the plain of the river Alento, with its intense cultivation of vegetables. We ride on towards Isca Longa to cross the river at its shallowest point. From here, past an area of reafforestation of pines and eucaliptus trees, we reach San Giorgio where, according to legend, there was a settlement of monks professing to the Greek rite, before the year 1000. After the war of Vespro (1282-1302) both the settlement and the village were destroyed. Following the paths along the river, we ride through the dense Mediterranean undergrowth with its intense colours and pungent aromas. Then we climb up the hill to the ridge, from where you can enjoy the sight of podolica cows grazing – an ancient breed of cattle with long, lyre-shamed horns. The panorama that opens up to our view is so breathtaking it hardly seems real: a vast expanse of green and olive groves covers the hillsides almost entirely and stretches out towards the azure blue sea. We stop for lunch at Guarrazzano, a tiny mountain village, but very characteristic. Our tasty picnic is freshly prepared at the agritourism that morning and served outdoors in a relaxed atmosphere - just what we need to replenish our energies and set off with renewed gusto. A few more hours on horseback before heading home. After the break, we saddle up our horses and ride up to Stella Cilento, known as “Porcili” (pig sties) until the beginning of the 10th century because, as history tells us, the inhabitants of the town were famous for breeding pigs. From here we take the path homeward, reaching the riding stables of the agritourism mid to late afternoon. A wonderful itinerary in Italy amidst the green olive groves and the sea of Cilento. Rendezvous at the riding stables of the agritourism situated in Casal Velino. As soon as we’re mounted, we’ll ride inland leaving the sea behind us, following riverbeds and fields, passing peach orchards and old ruins. The view is breathtaking all the way! After reaching the hill which overlooks the plain northwards, we’ll follow paths through open fields where cows graze freely to join the Old Salt Road, an old trading route which connected the coastal town of Velia and the sea with the inland population - the Enotri. At lunchtime, we’ll relax and enjoy a delicious picnic in the verdant shade of ancient olive trees. Here both horses and riders can take a well-earned rest. After our break, it’s time to saddle up the horses and get back on the road. We’ll follow a stream bed downhill to the sea, breathing in the fresh scent of vegetation, and return to the riding stables of the agritourism by mid to late afternoon. You may transferred to Naples airport in time for your flight home or stick around to continue your holiday in Italy. * This itinerary is a sample itinerary. Itineraries are subject to changes due to the weather, the trip guide's discretion and other factors. The is a combo riding vacatino and cooking lesson package including a 3 day cooking course, 3 days horse riding and half-board accommodation at the Agriturismo and farmhouse in Cilento and Amalfi Coast. This package is perfect for those who love Italian cuisine, southern Italy and horseback riding. During this week, riders will learn the secrets of Italian cooking and enjoy the Cilento National Park on horseback. * Prices shown are subject to exchange rate fluctuations. You’ll eat well and learn a lot about Italian cooking on this equestrian vacation. The family started their farm over twelve years ago. They have a cheese factory, produce their own extra virgin olive oil, wine and all kinds of vegetables, meats and more. If you are out for a full day of riding, lunch is served out on the trail, perhaps amid olive or oak trees with local wine. There is a spacious restaurant at the farm, where you can try the best local food and regional wines, a little store room and shop with the farm’s products, including a special kind of goat cheese. The wine cellar offers not the farm’s own excellent wine but also some of the best labels of the region Campania. Check out the other itineraries to see more samples of the horseback riding you'll enjoy while at this agritourism. The Amalfi Coast Relaxing Riding Vacation, the Campania Ride, is a shorter itinerary, perfect for visit the surrounding area of Cilento and, at the same time, horseback riding in this fantastic place. It includes 12 hours riding and half-board accommodation at the agritourism, an Italian farm. This riding holiday itinerary is particularly good in the hot summer months when it is too hot to ride during the day. The Campania Ride may be available at other times of the year, when it may be possible to have longer trail rides with a picnic. It runs Saturday to Saturday. * Prices shown are subject to exchange rate fluctuations. Riding vacation runs with a minimum of two riders and has a maximum of four. Thank you so much for a fantastic holiday. We really enjoyed riding your horses in such beautiful countryside. The food was wonderful and you made us feel very welcome. We had such a wonderful time and you were all just great and so kind... We miss you and the horses and our rooms AND the food. We spent two amazing weeks at your farm in July and enjoyed the weather, the animals, the fantastic meals at the restaurant, the pool, our apartment and the warm and friendly atmosphere. All the people are so kind and hospitable and the children were enthusiastic about the surroundings and most of all the riding lessons with Marco. We’ll certainly come back in our next holidays. We would like to thank you for the wonderful time we had at your place. The wonderful food, warm welcome and atmosphere, lovely views and homely apartment in the village. Rafael enjoyed his special bathtub and his first holiday very much, first swimming pool, first seaside, boot tour, the cat of the neighbors, the nice ceiling to look at, the sweet smiles from all Italians, playing in his tent in front of casa pendio and more and more and more. We hope to return soon with the grandparents and visit more of the park around you and enjoy the wonderful restaurant again. A terrific collection of some of the best literary writing on Italy, including pieces by Melville, Lawrence, Henry James, Mary McCarthy and many others. Each piece (they tend to run about 5-7 pages) is introduced thoroughly with a description of its historical, geographical, or literary context. Great reading. A handsome book highlighting Italy's charming and scenic villages. Featuring color photographs and an overview of history and attractions, favorite accommodations and restaurants by photographer-journalist Lazzarin. Translated from the Italian (the book was originally published for the Italian market as an introduction to unique and wonderful places throughout the country). Italy offers an extraordinary kaleidoscope of regions and experiences for all visitors. Packed with photographs, illustrations and maps the Eyewitness Travel to Italy has mapped out all of the remarkable flavors of Italy. Use this guide to help you decide where to stay, eat, relax, and shop. Every page in the Eyewitness Travel to Italy has pinpointed the highlights of each fascinating region. South of Naples, the Amalfi coast and beyond the Gulf of Salerno. March- October. July and August can be warm, so there is more limited riding during this time.